On 30 April 2013, the claimant requested interim measures of precise description; cf. Art. 77(1) lit. b of the Federal Act on Invention Patents. This is frequently referred to as saisie helvétique (for more details on this possibility in general, see this Blog here (item 6)). Moreover, the claimant requested such interim measures being ordered without prior hearing of the defendant, in order to prevent the defendant from any intentional modification of the allegedly infringing method or the computer/software controlling it. This far-reaching request failed for several reasons. First, the claimant only invoked a national Swiss patent. Note, that Swiss patents are not examined for novelty and inventive merit; cf. Art. 59(4) of the Federal Act on Invention Patents. Right from the outset, it is thus questionable whether the presumption of validity of a Swiss patent also extends to novelty and inventive merit; cf. BGE 4C.403/2005, r. 4.3 (Citalopram). Moreover, a court is obliged to examine requests for interim measures without prior hearing of the defendant very carefully; cf. the dispatch of the Swiss Federal Council (p. 7356, 2nd but last para.) of 28 June 2006 on Art. 261 of the Civil Procedure Code. Thus, a court must not rely on allegations with levity, but requires documentary evidence in support of any such allegation. With respect to a Swiss patent, this could have been e.g. 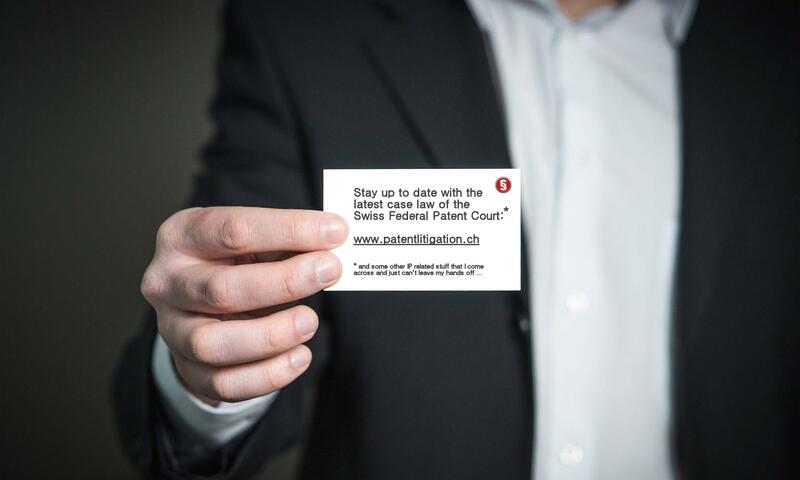 a (positive) search report for the Swiss or any corresponding patent application within the same patent family. However, the claimant did not even undertake any attempt to furnish prima facie evidence of validity of the patent. Thus, the FPC had no reason to assume validity of the patent in suit. Quite to the contrary, the validity of the patent was indeed doubtful. The patent application was filed only on 10 October 2012, claiming a priority of 28 Juin 2012; the patent was granted on 25 April 2013.1 The claimant conceded that the invention had been in use for at least ten years prior to the filing date of the patent in suit, by various undertakings. Moreover, products manufactured according to the now patented method had been sold long before the patent application was filed. No prima facie evidence of confidentiality obligations or factual secrecy was presented. The FPC was not even in a position to rule out that the defendant’s alleged use of the patented method was lawful, in view of some cross-ownership issues: Apparently, the defendant was co-founded and partially owned until 2010 by a person having been involved in granting the claimant a right to use the invoked invention at that time when no patent protection was yet sought for. Even though the defendant later on changed its name, the purpose of the company remained essentially the same as those of the claimant. 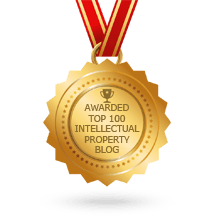 The FPC could thus not exclude without further prima facie evidence that the defendant is in fact authorized to use the method according to the patent in suit. Concluding, the FPC held that both the validity of the patent in suit and the non-existence of a right to use for the defendant are doubtful, for the time being. An abuse of the harsh measure of a precise description cannot yet be excluded without prior hearing of the defendant. However, if the defendant would be notified of the interest of the claimant in the precise description without any measure being ordered by the FPC at all, he would not be hindered from modifying the allegedly infringing method. Any subsequent request for a precise description would then have no impact anymore. In order to safeguard the legitimate interests of both parties, the FPC chose to uphold a certain element of surprise. According to the principle “in maiore inest minus”, preservation of the existing state of affairs at the premises of the defendant was ordered (cf. Art. 77(1) lit. a of the Federal Act on Invention Patents), pending further court order. The order was issued under the threat of the criminal penalty for non-compliance; Art. 292 Criminal Code. The defendant was also given the opportunity to comment on the allegations in writing; cf. Art. 253 CPC. This case is to be continued: Upon receipt of the answer of the defendant, the FPC will decide whether – and, if so, how and to which extent – a precise description according to Art. 77(1) lit. b of the Federal Act on Invention Patents is to be ordered. 1 The date of grant appears to be mistyped. 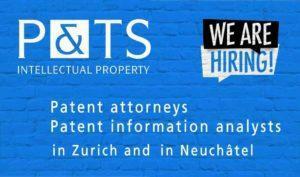 According to Swissreg, no Swiss national patent has been granted at all on 25 April 2013. The patent is CH 705 576 B1, for sure. All dates fit, except for the date of grant. Anonymisation doesn’t work like this . ..
It’s a bit like reading tea leaves. You never know what the typo is. I focused on the legal questions. In my perception, the subject-matter of the patent itself is pretty much irrelevant, for the time being.